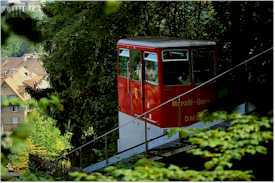 ABOVE: A funicular car of the Marzilibahn, which provides transportation between the city center of Bern, Switzerland and the River Aare. Visitors to the Alps are often confused by the terms used to describe the rail and aerial transportation systems that haul tourists and skiers from valleys to mountaintops. In this article, I'll describe the three basic modes: funiculars, aerial cable cars, and cogwheel railroads. A funicular cable car is a hybrid of a railroad and an elevator or lift. Two cars of equal size and weight are attached by a cable that loops over pulleys and a drivewheel at the upper station. As the drivewheel moves the cable, one car goes up the track while the other goes down. The two cars pass each other (typically on a short section of parallel tracks) at the midpoint of their journey. 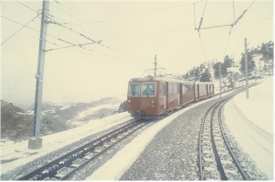 Funiculars are used on slopes that are too steep for conventional railroads. Normally they travel in straight lines, like an elevator or lift, covering distances that range from about 100 to 1000 meters. INSET PHOTO: An aerial cablecar transports skiers to the Gemstock in Andermatt, Switzerland. An aerial cable car consists of a reversible moving cable with a gondola suspended underneath at each end. The gondolas convey anywhere from a few dozen to a hundred or more passengers per trip. Like the cars of a funicular, the two gondolas are counterbalanced. When one gondola is at the upper station, the other is at the lower station, and the gondolas pass each other on their ascent and descent. Aerial cable cars are used in locations where a funicular isn't practical: e.g., over undulating terrain or to carry passengers from the bottom to the top of a cliff. ABOVE: A train of the Gornergrat cogwheel railway in Zermatt, Switzerland. The toothed center rail meshes with horizontal gears on the electric locomotive. A cogwheel, rack-and-pinon, or rack railway is similar to a conventional railroad, except that the locomotives or self-propelled railcars are equipped with horizontal gears. These gears mesh with a toothed rail between the ordinary rails, providing traction on slopes that are too steep for propulsion via conventional adhesion (wheel against rail). Often, mountain railways use cogwheel or rack-and-pinion propulsion only on sections that require the extra traction. If you're traveling on such a railroad, you'll sense the change to cogwheel propulsion when the train stops and the engineer or engine driver engages the cogwheel. For an illustrated introduction to one of Switzerland's most famous cogwheel railroads, see our article about Pilatus Kulm.